My son had a bad cough and this helps him ease that bad cough and all the mucus in his throat. He loves the flavor and it dissolves really fast. The best part is that it is so easy to give to picky children who will spit out medicine. Also when your child is sick you do not want to have to take the time to measure out teaspoonsful. My child didn't mind the taste and he is very picky. It seemed to work fast enough. I believe its a little on the expensive side but really worth the cost when it comes to the best choice for your child. I really don't have anything bad to say. The best for my kids. It is really hard to find a medicine brand that you trust when it comes to something that you are going to be giving to your children. Every time my children come home sick with a cough, this is the first thing that I give them. These are little tablets that you give to your children and they put them on their tongue and they dissolve really quickly. This makes it really easy to give a child who already doesn't feel good medicine, as I have found that my kids love to fight me on a lot of different medicines, this is one that they never have a problem taking. This helps really well with their cough, it seems that within a few hours of taking this they are already feeling a lot better and their cough has dramatically changed. I do noticed that it does loosen up everything that is congesting them so that when they do cough they sometimes have a lot of stuff come up with it, but this is clearing them out and making them better in the end. My kids also sleep a lot when they are taking this, it makes them relax a lot and then they fall asleep and rest up so that they are all better. First of all, some of these ingredients and medicines should not be given to young kids. Secondly, the kids who are old enough to take it, don't like it. My two kids both tried it once and hated the taste. I tried it, and I must say that I don't blame them at all. Finally, this doesn't offer any of the benefits that mucinex does in terms of clearing out congestion. I don't know what all the hype about Mucinex is. I haven't seen anything that fantastic with it. The childrens version isn't any better. The only reason that I bought it to have in the medicine cabinet is it was on sale and a friend said it worked well. I was very let down when I purchased it. I gave it to two of the kids that I was nannying for at the time. They both were sick, and suffering from congestion and bad coughs. There mother said they had taken the mini melts before so I gave them both a dosage and waited. It ended up doing more bad than good at least with the older one. She within an hour was complaining of an upset stomach and threw up. With the younger all it did was make her drowsy, it didn't help either of there coughs, and they were both congested. Even on sale it wasn't worth the price, it didn't do anything it said it would. I would not reccomend it, and it just cemented the fact that I don't like Mucinex products. Relief of Aches & Pains They weren't complaining of being achy so I can't attest to this. I used Mucinex Cough Mini Melts for Kids on my son not to long ago and was quite pleased. He had been feeling kinda bad over the weekend and I knew that he was coming down with a cold or the flu. I was hoping that it was just a cold and it turned out that indeed it was just that , a cold. It started with a little cough on Sunday afternoon when we were out at the movies. I gave him a cough drop that I had in my purse and it seemed to help for a little bit. Anyway on the way home I stopped at the drug store and went in to purchase him something for his cough. I didn't want him to wake up in the middle of the night and not have anything to give him. I went to the cold and flu isle and started looking. I could not believe all the medications they have! It would have taken hours to read everyone of those packages. I went frantically to the pharmacist and asked which one I needed . I told him what was going on and he suggested I try the Mucinex Cough Minimelts for kids. He helped me find them and I purchased them. Later that night as I was getting my son ready for bed I over heard him coughing again so I went to the bathroom medicine cabinet and grabbed the Mucinex that I had just purchased and gave him one. Well after a few minutes he wasn't coughing and he slept very peaceably that night. The Mucinex worked wonderfully. I took him to the pediatrician the next day and he said there was just a bad cold that kids were passing back and forth and that as long as he wasn't running a fever to continue to use the Mucinex and make sure he washes his hands. It was great finding Mucinex Cough minimelts. My son likes the way they taste so it is a lot easier to get him to take it. I love the way it works. 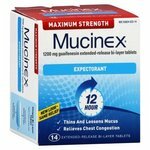 I have used the other products by Mucinex but had never run across the children s.
Don't you hate it when your kids get sick. I'm not talking about the yucky stuff either. I'm talking about getting them to take the medicine. That's the tricky part. When my kids get a cold and start that dreaded cough from the post nasal drip I always turn to the Mucinex cough melts. My Dr. introduced me to them with a sample years ago. 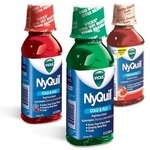 A lot of parents make the mistake of just giving cough medicine to surpress the cough. You need to give an expectorant to get the phlegm up. Alot of those expectorants taste nasty. You can just smell that horrid mediciny smell and as an adult you don't even want to taste it. These mini melts are sold in a box with individual packets. It's perfect for those younge kids who just refuse or spit out there medicine. These granuals taste good and melt immediatly in there mouth. 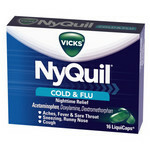 They are a little more pricey than the other liquid medicines,however to me it's well worth it. You can't go wrong with this item. A favored form of medicine for little ones! 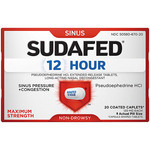 This product is a great way to help parents administer medicine to their children more easily. As usual, we have had a tough time getting our son to take medicine in the past. We picked up a box of Mucinex "crystals", as our son calls them, on a whim to see if we could get him to more willingly take cough medicine in this form. We were happily surprised to find that he favored this form of cough suppressant. Now, we no longer have to deal with the headache of calming his cough in addition to the anguish having a sick little one already entails. This product is a blessing for parents and children alike! No more coughing fits worsened by a child getting worked up about medicine that they don't like. The intentions of this product are many but it is still wanting. My kids aren't sick often, but when they are it's usually a cold or cough. With a stuffy nose cold I tend to let them ride it out. With a cough however, it can cause them to lose sleep if it isn't under control at night. One particularly strong round of a cough my husband picked up Mucinex Cough Mini-Melts to help soothe the coughs. While the little ones haven't been horrible about taking medication, the Mini-Melts help immensely with administering meds. 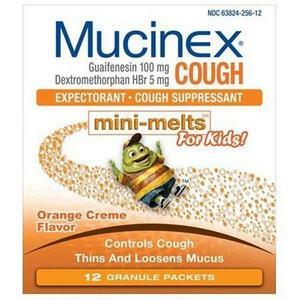 Mucinex Mini-Melts are a cough suppressant and expectorant. 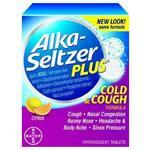 Instead of being in a liquid or pill form, this is in a powder form in a small packet, similar to the water enhancers. Chest Congestion Relief I'm not sure the expectorant portion did much for the kids really. It still took several days for the cough to dissipate. Cough Suppression During the day I let the kids cough their way through the day as that helps bring the gunk up faster. Unfortunately if they continue coughing through the night they (and me) will get no sleep, making for crabby kiddos (and momma). So I've always administered the Mucinex Mini Melts at night as a last resort. Upon giving my son a package, he was off to bed with his cough ceasing shortly after. The package states for children 4-6 years to take 1 packet every 4 hours. Seems like it allowed my son to sleep through the night, which I was grateful for.